Always wanted to make chip shop quality chips or deep fried chicken at home? Grab yourself one of the best deep fat fryers to make your life easier and (some of) your meals naughty but nice. If you've got more of a sweet tooth, you can also use them to make sweet treats such as donuts and churros. Scroll for our pick of the best deep fat fryers for your kitchen. For other cool kitchen gadgets, why not check out our other recommendations? All the best appliances, both small and large, are on our dedicated hub page. There are plenty of well-known brands on the market that all offer some great options. 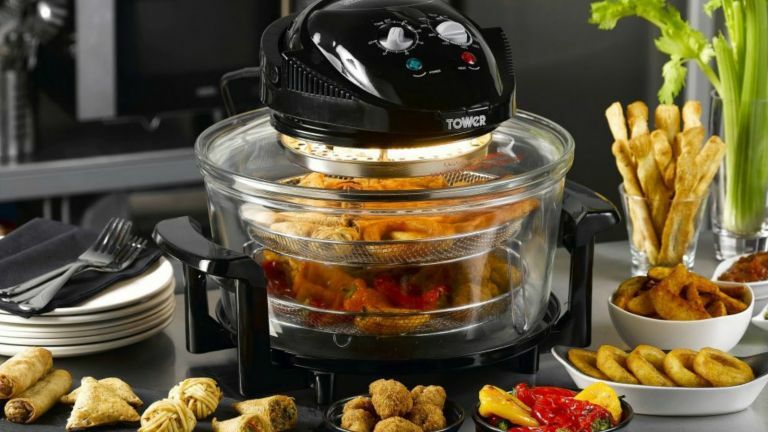 Keep an eye out for the likes of Tefal, Morphy Richards and De’Longhi, to name a few, as most of these brands will offer a versatile fryer for making all of your favourite foods. The capacity of the deep fat fryer is one thing to look out for. Most standard sized fryers can cook between 1kg and 1.5kg of food, and will need up to 3 litres of oil to cook. This is usually enough for a family; a compact option like the Russell Hobbs Compact Deep Fryer will only cook enough chips for two. Safety features, such as a lockable lid to stop spills, and dishwasher safe parts for easy cleaning and maintenance are worth looking out for. Looking for an easy-to-use deep fat fryer that has a few added bells and whistles? The Andrew James model is our pick of the best deep fat fryers. Not only does it have a very decent capacity of 3 litres, enough to feed a family, it also has a dishwasher safe basket and lid, and an ultra-useful viewing window so you can see when food is good and golden. You can use the simple dial to set the machine to a desired temperature, and the auto shut-off safety feature will ensure the fryer won't heat up if there's no oil in it. If you don't want this compact model on your kitchen worktop, the built-in cord storage allows it to be easily packed away until its next use. Want the yummy deep fried food but not a fan of the clean up afterwards? This deep fat fryer has a non-stick coating and an easy clean system which means maintenance is easy. One of the best deep fat fryers for even cooking results, this machine has a rotating fry basket – you can simply set the cooking programme and it'll notify you when the food is ready – plus there's a useful viewing window so that you can keep an eye on it without opening the lid. This is one of the best deep fat fryers for chips, so whether you want chip shop style thick cut chips or thin fries, you can expect good things from this slim design. It holds around 1.2kg of food, and is quick, easy and clean to use. The cool zone technology of this deep fat fryer means any crumbs or scraps will not burn on the basket, and the transparent cooking lid combined with the variable temperature setting allows you to see the progress of your chips so that you can get them cooked just the way you like. The first ever deep fat fryer to have a dedicated twice-fried fries setting for super crispy chips, the Sage BDF500UK also features other cooking settings including fish, wings, calamari, donuts and many more. With an LCD food menu that displays a count down timer and automatically sets time and temperature for your food whether it's frozen or fresh, this powerful 3000W machine cooks food fast. It also features Cool Zone technology to prevent your food from burning. There's no need to worry about mess, as the machine's lid and vessel are designed to catch splatter. After cooking, this deep fat fryer can also be popped in the dishwasher for easy cleaning. The best deep fat fryer for those after something on the luxury side. This deep fat fryer from VonShef boasts a generous 1.3kg capacity so you can make food for all the family. The removable non-stick pan combined with an adjustable thermostat makes sure you can fry foods so they are perfectly golden. Despite its capacity, this model is sparingly slim, making it a neat fit on your kitchen counter or inside a cupboard. There's also a cable compartment to keep messy wires out of sight. Sometimes just a little taste is all you need. If you don’t always cook for the whole family then this compact deep fat fryer is ideal for avoiding wastage. Not only is it very reliable, but it doesn’t require as much oil as a standard fryer and it can make fries in less than 10 minutes. However, some foods might be a little bulky to fit in the basket – or you might just have to get creative with shapes. Perfect for those naughty midnight snacks, we think. If you’re someone who tends to burn anything they cook, then this deep fat fryer from Breville can give you a helping hand. The digital timer means you can set this fryer to cook your food and then notify you when it’s done, and it also features a safety lock lid so no accidental spillages can occur, which is reassuring if you have kids about. You can view the progress of your food through the lid and also won’t need to worry about little hands touching the sides as the body remains cool to touch. In our opinion, this is the best deep fat fryer for accuracy. For those evenings where you fancy treating yourself to something naughty, this little fryer holds just enough for a two-person portion. It's sleek and compact, as well as incredible easy to use. It heats up quickly and you have an indicator light to let you know when the temperature is ready for frying so you can expect to get professional results each time. When you’re finished, the machine is easy to clean thanks to the bowl being dishwasher safe. In our opinion, this is the best deep fat fryer for small families. If the idea of a deep fat fryer fills you with guilt, then there is a healthy alternative which will still allow you to indulge in your favourite crispy treats. An air fryer uses 80 per cent less fat than a deep fat fryer, and is just as quick and convenient. Admittedly it doesn’t taste quite the same, but it is close enough to the real deal for those who are really looking to count calories. This model also features a browning and roasting function which enhances flavour and crisps up certain foods. You’ll also get a recipe book included so you can try out some healthy meals. Looking for an easy to use deep fat fryer? The Swan SD6060N offers no fuss and no mess whenever you fancy some crispy chips. Thanks to its adjustable thermostat, you can control the temperature how you like, and the indicator light will let you know when you’re good to go. The detachable basket is key in terms of safety and is designed for anything from frying chips to fruit fritters and even onion rings. In terms of cleaning, it has a non-stick coating so you won't need to worry about scrubbing, as well as a dishwasher-friendly basket, lid and housing. The machine itself is pretty compact, so it'll easily slot into a kitchen cupboard if you don't want it on display all the time. The best deep fat fryer for those who are looking for something easy, we think. Complete with a cooking time guide, this little fryer can squeeze in enough food for two portions, and because it's so compact, it's easy to store. It has a safe-lock lid for peace of mind and an adjustable thermostat for cooking different foods, as well as a cool zone to keep your oil fresh for longer. Although not dishwasher friendly, it does have a non-stick coating for easy cleaning. We think this is the best deep fat fryer to buy if you're on a budget.